As I mentioned in the last post, I considered leaving this post out of the series altogether. However, the more I thought about it, the more I realized many of you may actually need to hear about my experiences to help you validate your own. Many times witches think that what they are experiencing isn't real or just all in their head. One of my favorite lines from Harry Potter is part of the conversation that occurs after Harry is "killed" by Voldemort and is talking to Dumbledore at King's Cross purgatory. Dumbledore beamed at him, "Of course it is happening inside your head, Harry, but why on earth should that mean that it is not real? There is a reason this is one of my favorite lines because, for anyone who travels astrally or communicates with spirits, we sometimes doubt our abilities. Even if it is just happening in your head, it is still very real. Doubt is a plague that will destroy your magic; don't let it rule you or your magical abilities. I'd like to briefly share two of my hedge riding journies with you guys today. Please be aware there was much more that occurred during this journies then what I am sharing. I want to keep some aspects of my travels private, as the messages I received were for me and me alone. However, the gist of the journey is still there and should help you get an idea of what to expect. This journey occurred on June 15, 2017. I followed my normal route to enter the Lower Realm, walking the dark, earthy steps down until I reached the cave floor below. The cave is always cold and smells of damp earth, but it feels like coming home every time I enter. I make my way through the tunnel and push aside the vines that cover the opening, protecting this entry into our world from prying eyes. From the outside you can't tell there is even a cave here, making me feel even more comfortable that my passage to and from the Lower Realm will be safe. I've asked Meka and Rocar to meet me outside the cave and sure enough, they are waiting. Rocar has an expression that says I kept him waiting too long. Meka is overjoyed to see me, rubbing up against my leg and nuzzling me softly. She is always happy to see me. I asked them to meet me here to ask them if they have any messages for me. Meka says we would be more comfortable in my garden, so we travel through the woods, upwards toward the Middle Realm where my garden gate is located. This is essentially my astral office, but much more enjoyable. Upon entering we make our way to the lake and stump I like to sit on when we converse together. Rocar takes off ahead of us, soaring through the trees impatiently. Meka walks slowly beside me, silent the entire way. When we make it to the stump, I sit down and wait. I've found sometimes the best way to ask a question, is not to ask at all. Suddenly I begin seeing a series of images, all showing turmoil. I'm taken aback by these images and my anxiety grows. I can feel myself wanting to return to our realm and leave these disturbing images behind. But just as quickly as they began, they were gone. I was breathing heavily and Meka and, surprisingly, Rocar looks concerned. Meka explained these images are how I feel about myself and my depression, and she's right. I often feel in constant turmoil, not just from depression, but anxiety as well. Rocard explains the self-hatred I feel is not a true reflection of who I really am and my loneliness is about to get much worse, but it is unjustified. Meka rubs up against me again and Rocar nuzzles my cheek, a rare sign of love from the stubborn, sassy bird. I am loved, they both chime in unison. Meka explains that we will tackle my depression in the future, but first I need time to heal physically (I was suffering from an infection at the time). I thank them both for the reassurance and the lesson and make my way back home. At first, this journey was very upsetting, yet comforting at the same time. What I didn't understand, and what Rocar was trying to gently tell me, was that soon I was going to be faced with extreme turmoil that was going to set my depression into a tailspin. He mentioned things were about to get worse, and boy was he right. A month later my now ex-husband walked out on me. My guides knew this well before it happened, and were trying to tell me to prepare for the worst in their own way. Spirits, even our guides, often speak to us indirectly. Sometimes they can't express themselves in a clear manner we will understand. Instead, it is up to us to decipher the message. Thankfully when the time came, I was prepared and while I was still caught off guard, I managed to navigate my way through a really tough time in my life gracefully. This journey is more recent, occurring on July 12, 2018. The purpose of this journey was to see what my New Moon intentions should be. I began my journey as always, traveling to the Lower Realm to meet my guides. Upon arrival, Meka and Rocar were there to greet me. I asked them both what I should set as my New Moon intentions and before I could finish asking, Meka took off running through the forests and fields for what seems like miles until she reached a lake where she laid down to rest. I cooled myself in the lake, enjoying the cool water on my sore muscles. After a while, we were all well rested and Meka set off again. She led me to the House on the Shore. I told her I was not ready to enter today. The place still fills me with a sense of dread. Whatever is in there is not friendly, at least not toward me. Meka has brought me to this house several times. Obviously, I'm meant to enter, but today was not the day. The next thing I know I am riding on a dappled horse through the plains. I hear a cry to my left. I am surrounded by Native Americans. I feel a weight on my back. I'm carrying arrows. I'm one of them are we are hunting buffalo. My tribe manages to isolate one and bring it down. I sit on my horse watching as it dies. I see the buffalo's spirit rise from its body and dance away into the heaves. The carcass is cleansed and the animal thanked for its sacrifice. We begin carving the animal, bringing its remains back to camp. That night a meat stew is severed and the elders smoke pipes and tell stories. I am tired so I retire to my bed for the night. When I awake it is morning and my hands are stained with red. Blood? I stumble outside my abode, confused and concerned but Meka is there to calm me. Its just the paint I used to mark myself, she assures me but says it is time to go before she takes off quick as the wind through the fields. I begin to feel my time is short. When I look up I am surrounded by unfamiliar faces. I spin around and around trying to take it all in, but they are endless. Their voices grow louder, hurting my ears until I am forced to cover them and close my eyes. I scream "Enough!" and the voices stop. Are these my ancestors or past lives? I saw faces from all races and nationalities, mostly women, but a few men thrown in as well. I feel Meka between my legs calling me back. I open my eyes and they are gone. She smiles at me and says, "Next time." in her all-knowing tone. I can hear the drums calling me back, so I find the cave entrance and make my way back up the stairs and back to our realm safely. There were several other things that happened during this journey that I do not wish to discuss openly, but this particular journey still sticks out to this day. If I'm being honest, I still haven't entered the House on the Shore, nor explored the people I saw any further. Every time I journey there is something else that must be tended too. Meka and Rocar often give me little nudges in the right direction, letting me know that the time will come to face my demons and those of others I have brought along with me. Your guides will likely do the same. I went to set New Moon intentions and came back with much more than I bargained for. There was a lot to think about from this journey, and I am still working on the intentions set during the New Moon in July. You will likely find yourself doing the same. 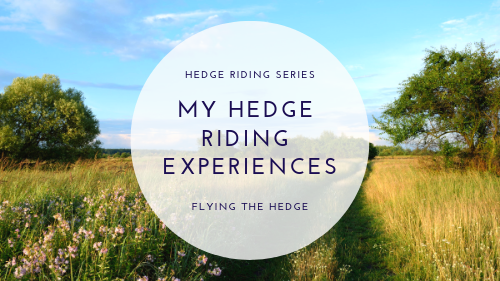 I sincerely hope that this series has been helpful for those of you interested in hedgecraft and hedge riding. This guide is nowhere near complete but is enough to get you started on your journey into the Otherworld. I will continue to post about hedge riding and my experiences in the future, especially regarding shapeshifting and setting up your own astral office or garden. I'm even planning to discuss summoning your guides to our realm, if they are willing, and how to bind them so they may aid in your magical workings on our plane. Until then, happy travels! I've been pretty behind on my reading this year, but that's okay because what I have read has been fantastic. Quality over quantity, right? 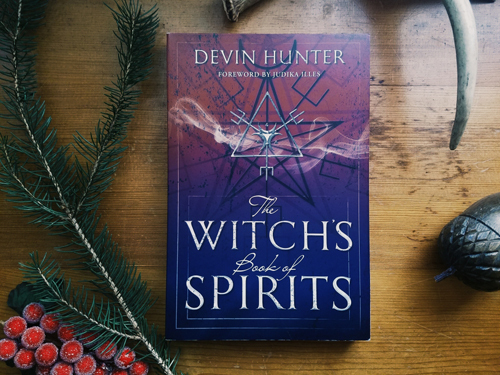 I recently finished The Witch's Book of Spirits by Devin Hunter, and while there were some things I disliked, this is probably one of the best books I've read this year regarding spirit work. Hunter's book covers spirit work in great detail, including mediumship, flying (think astral travel), and conjuring. 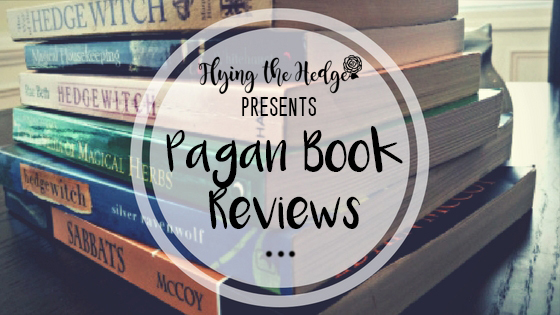 Being Wiccan, there are Wiccan undertones throughout the book, but it doesn't detract from the information nor drive the principles outlined in the book. At first, I wasn't sure I was going to like Hunter's take on spirit work. I rolled my eyes a couple of times in the first chapter or two and remember saying to my boyfriend that I didn't think this was going to be the book for me. However, the more I read, the more I started shaking my head in agreement instead of rolling my eyes. Hunter takes a ritualistic approach to spirit work, pulling from his knowledge and experiences of being a medium and spirit worker for several years. His stories, which are sprinkled throughout the book, offer insights into the fine art of spirit communication. Hunter offers a fresh perspective, discussing in detail rituals and exercises he uses to focus his mind, contact spirits, and even summon and bind spirits to our realm. Thankfully, Hunter also touches on some topics other witches tend to gloss over in regards to spirit work, the first being demons. Hunter, like myself, knows demons to be destructive, necessary forces that oppose order. Unlike other witches, Hunter makes it known demons are not evil creatures; however, some are up to no good and may, in fact, wish us harm, but that doesn't mean we should avoid working with them altogether. His description of other spiritual beings, including angels, faeries, and guides, is on point, aligning extremely well with my personal experiences, making this book very real to me. I've read several other books on spirit work that describe beings and places of the Otherworld in such a way that I have never seen or experienced, which makes me feel like those authors may be writing a book for money, not to share real knowledge. Hunter's book is not one of those. He clearly knows what he is doing and has been in contact with spirits who have shared their vast knowledge with him. In one of the final chapters of the book, Hunter introduces what he calls the VEXNA-KARI and 33 other spirits who are part of this group. I've never heard of these spirits before Hunter began describing them, but there is one in particular that wished to speak to me almost immediately, Sugar Momma. Hunter briefly mentions that Sugar Momma was the first of the 33 spirits he met with before writing his book. As soon as I read her name, the smell of perfume and laughter filled my living room. I looked up to see a plump, dark-skinned woman dressed in New Orleans style garb sitting on the velvet chair across from me. She smiled at me and when she spoke it was like honey. This is one of the most profound experiences I have ever had while reading the work of another witch. After a few moments she was gone, and I continued on with the book, reading Hunter's description of Sugar Momma some 15 or 20 minutes after meeting her myself. Upon reading Hunter's description, I was 100% sure that she had decided to visit me first as well, probably excited someone was reading about her. This is just one of three similar experiences I had while reading this book, which is part of the reason it will be added to my must-have list. For those looking for a more ritualistic approach, Hunter has you covered. His Keys of Hecate, which he states were presented to him by Hecate herself, offer that ritualistic Wiccan display of high magic many witches crave. From personal experience, however, I have found that no such "keys" are necessary to communicate with the spirit world nor to summon or bind a spirit in our realm. However, I know other witches rely on such steps to bring their magic into reality. While the book is wonderful, there are a couple of things I don't agree with, most notably his description of the realms. His setup is slightly different than mine, which is based off the World Tree. I'm not saying Hunter is wrong, I'm simply stating his outline is not supported by my personal experiences, but this is probably two minds attempting to reconcile the same information in different ways. Furthermore, I am slightly wary of the Wiccan undertones in his exercises. I don't disagree with his practice per se, but I am personally not a ritualistic witch, preferring to work with my intuition and often on the fly. Overall, this book is a must-have for any witch, new or old, looking to work with spirits. It offers some wonderful insights into traveling to each of the realms, how to work with different spirits, and how to build relationships that last multiple lifetimes. Hunter's work is inspiring, easy to read, and, in my opinion, reliable. If you are looking to begin your journey to working with the Otherworld, this book is a good place to start. 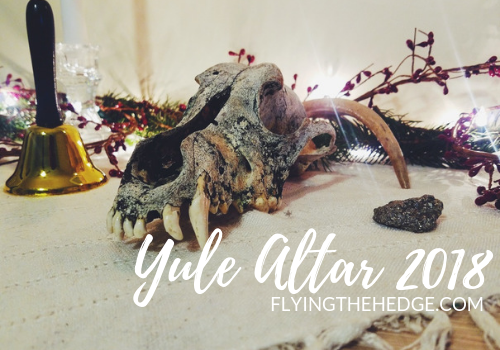 Happy Yule, ya' filthy pagans! 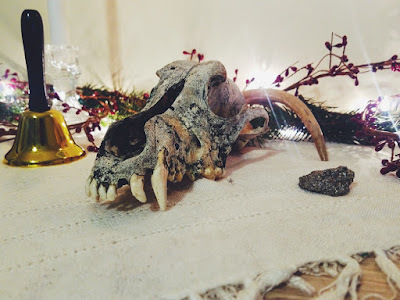 A couple nights ago I put together my Yule altar using some items found around my home. When possible, I prefer living decorations over fake ones. Just feels more witchy to me. 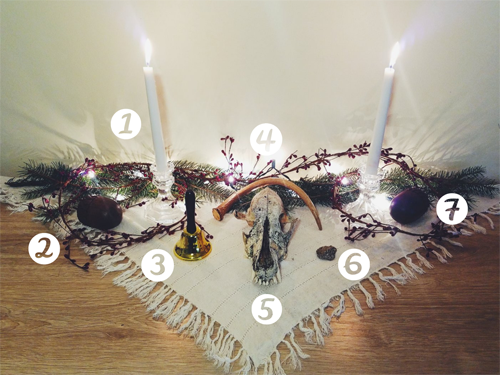 For this altar, I chose a skull, antler, pyrite, white candles, a bell, and some fir and berry garland mixed with Christmas lights to celebrate the season. 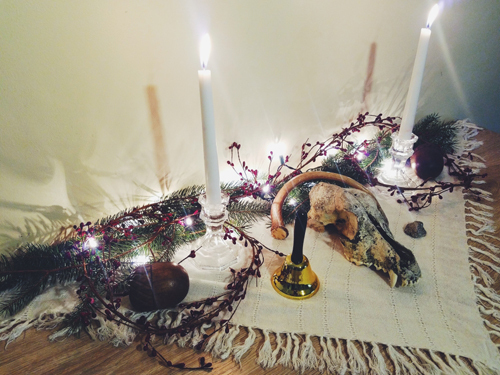 Furthermore, I chose white, green, red, and gold tones to pull the altar together and represent the season. How did you celebrate Yule this year? 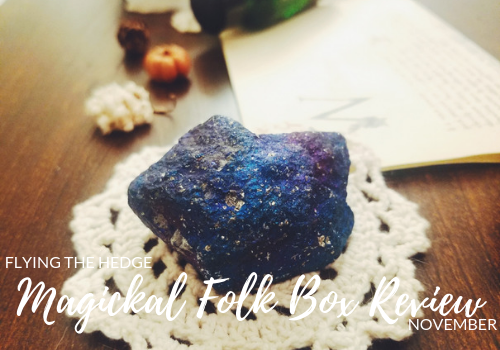 November's Magickal Folk Small Combo box focused on the feminine. As mentioned previously, the small combo box comes with a tea ritual, meditation kit, and crystal alchemy kit, essentially a little bit of everything they curate for the month in one box for just $24. 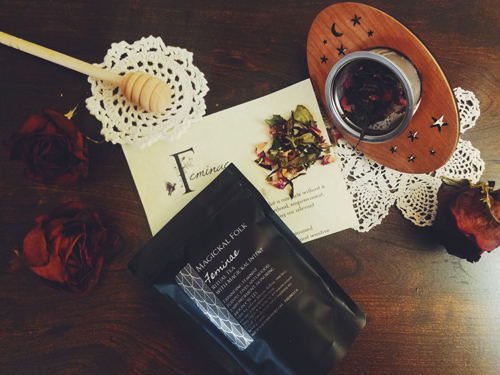 The first item from the box is the Tea Ritual Kit, which contained a tea called Feminae. According to the packaging, the tea is a blend of white tea, red rose, hibiscus, skullcap, vitex berry, rose hips, and pomegranate flavoring. Not going to lie, this tea is a beautiful rose color, smells like heaven, and tastes like a flower garden. I'm so in love with it. When I read the ingredients after removing it from the box, I knew in an instant I would enjoy this tea. I am a sucker for rose, rose hips, and hibiscus. To add to it, the base is a white tea, which is milder and sweeter in flavor as it comes from young tea leaves. The ritual suggests imbibing this tea with your fellow lady witches to inspire conversation, especially during our "moon cycle" or consumed ritually in tribute to the Morrigan. Honestly, I would pair this tea with Dulsky's Holy Wild. The book is all about taking back our Goddess powers and the message pairs amazingly with this tea! The next item is the Meditation Kit, which focused on the sacred Wolf. The purpose of this meditation is to connect with the wolf in your life as well as honor the spirit guides in your life. 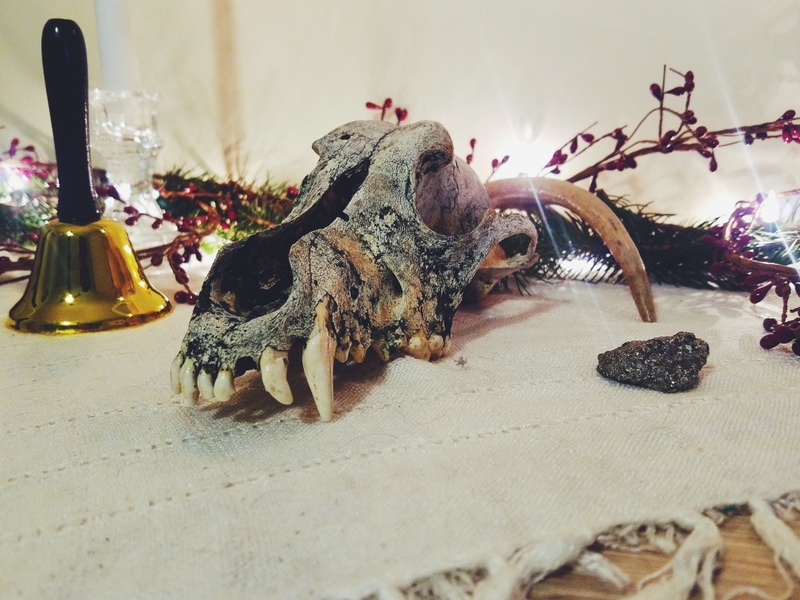 As a hedgewitch, I absolutely love that this month's kit included ways to honor and connect with your spirit guides. 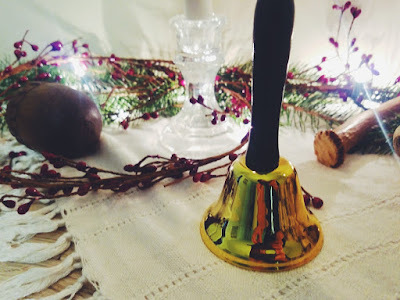 They are so crucial to our development as witches and the meditation outlined by Candice at Magickal Folk is beautifully written and easy to follow, even for a beginner witch. 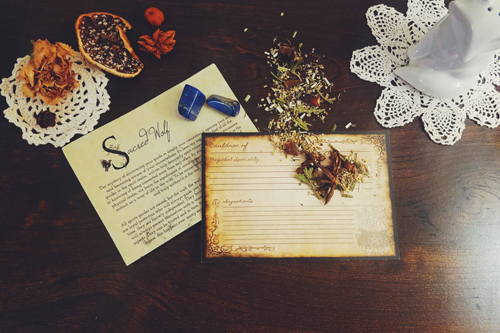 The kit included a cauldron recipe card to record the ingredients included in the kit as well as any other items you add to the ritual to connect with your guide. 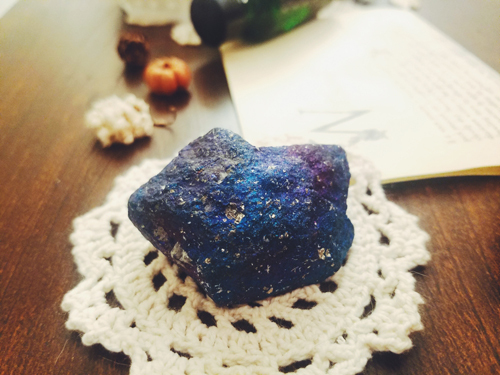 There are two beautiful Lapiz Lazuli crystals and an herbal incense mixture that contains cedar and juniper tips for protection, star anise to carry your messages, wood betony for removing doubt and opening communication, and elderflowers to bring ancient wisdom. I love how well thought out this mixture is and that is can be used during hedge riding or a normal ritual to communicate with spirits. 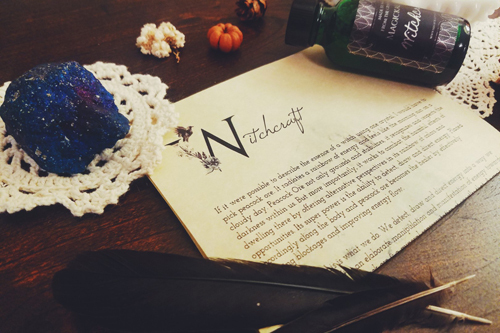 The final kit, the Crystal Alchemy Kit, contains a large piece of peacock ore and a witchcraft oil both of which are designed to increase magical intentions. The oil contains jojoba, olive oil, and sunflower oil infused with dragon blood resin, honeysuckle flowers, and vervain herb. 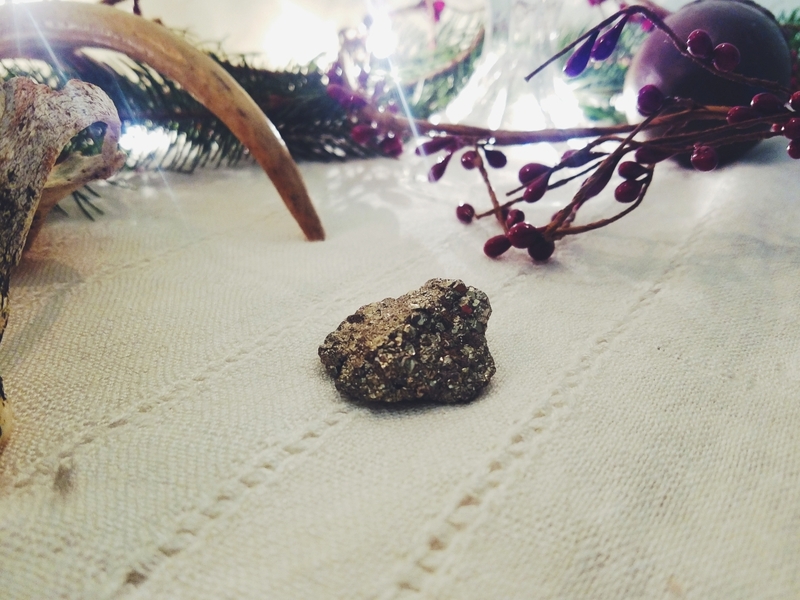 Candice suggests using it as a base spell oil during rituals or to banish, heal, and enchant. There are no essential oils in this product, which I think it great because many people are allergic to essential oils. 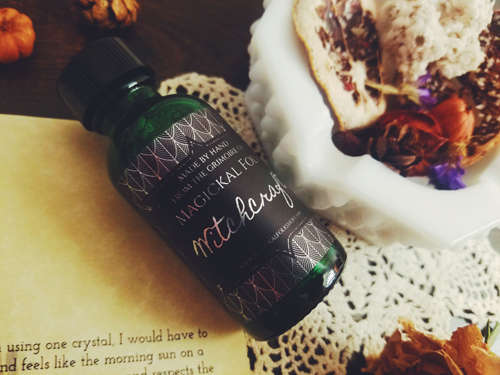 This also allows the oil to be more versatile so it can be placed on the skin, the third eye, or used to anoint candles and other objects used in spell work. The oil has a sweet, subtle scent; nothing overpowering here! Overall, I love the diversity in this month's box. I'm not going to lie, the tea is my favorite part! Once this subscription is complete, I may purchase the monthly tea ritual for just $5. Considering how many cups I tea I get per bag, $5 is a steal! On average, I get 7-10 cups of tea. Remember, you don't have to throw the tea out after one use. Using freshly dried herbs means you can get at least 2 cups out of most teas, so don't throw it away after one cup! Besides, the tea leaves can be used in later rituals as an offering or just to enhance your spell work! 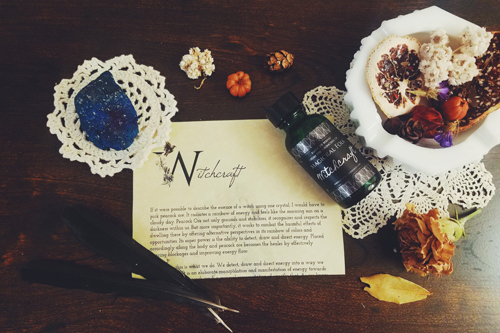 Have you subscribed to any witchy or pagan subscription boxes lately? Have something you would like me to review before you commit to a purchase? I am on the lookout for something new to try next year and would love to hear from you in the comments below! One of the reasons I love this time a year so much is because suddenly the majority of people become a little more charitable. Every year I adopt a local family to buy presents for, I donate canned goods and clothes, and if I am able to, I give up some of my precious time to help others. I'm particular about the charities I get involved with, as many use the opportunity to make money instead of giving money. It's even harder when there are conflicts of faiths. For example, I absolutely LOVE the idea behind Operation Christmas Child, but I HATE that they go into developing countries and use God as a weapon against children. I don't support that ideology one bit. So what's a witch to do? 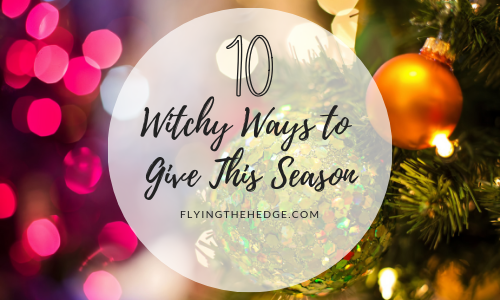 I've done the legwork and came up with a list of 10 witch-friendly charities to give to this season. I've also included instructions on how you can find local charities to support and how to find the ratings of those charities. Even been to a Pagan Pride festival in your local area? If so, this is the organization that helps fund and coordinate those events. They are a nonprofit organization that not only brings together pagans but also promotes social responsibility by hosting a food drive at all of their events. If you've ever been to one, you've probably "paid" to get in with canned goods. The local was rented using donated funds, so to keep these events going around the world, consider a small cash donation through PayPal. A neo-pagan alternative to the Boy Scouts and Girl Scouts, that offers a welcoming environment to children and families of all faiths. They do essentially the same things as Boy/Girl Scouts but are more inclusive and they focus more on caring for our Earth and honoring her in a way befitting us all. Currently, there are about 45 circles and hearths all over the world. Consider starting a circle in your area or make a donation to keep their programs running. If you are looking to get a little something out of your donation, they have a beautiful Goddess Coloring Book and Pagan Kid's Activity Book that would make a wonderful Yule gift to the child in your life. Not directly pagan/witch, but these are the people fighting for our religious freedoms and protections in the United States. The ACLU is the people who fight for you when your employer tries to fire you for being a witch. These are the people that fight for you when our government attempts to pass a law banning pagans or LGBTQ members from our military. According to Charity Watch, the ACLU Foundation has an A+ rating which means they are using most of your money to support their mission, not pay their top executives a hefty salary. In other words, they are putting their money where their mouth is. They do good work to keep us safe. Again, not very witchy, but extremely important to environmentally conscious people like ourselves. The Center for Biological Diversity helps preserve and protect threatened and endangered species through advocacy, research, and environmental protections around the world. These are the people fighting to keep tigers, elephants, leopards, red wolves, and a host of other species from going extinct. While you may not think an individual species is important, as a biologist, I can assure you they are. Loss of a single species often causes a cascade effect in the ecosystem. This means less diversity for us to enjoy, whether it be for pleasure or for scientific or commercial use. Biological diversity is extremely important to the survival of all life on Earth. According to Charity Watch, The Center for Biological Diversity has an A.
I love this charity. The Arbor Day Foundation is a US-based charity that plants trees where they are needed the most. In light of current deforestation issues, these are the people world diligently to plant more trees to increase habitat, reduce climate change, and just make the world a better place to be. Charity Watch gives the Arbor Day Foundation an A-. 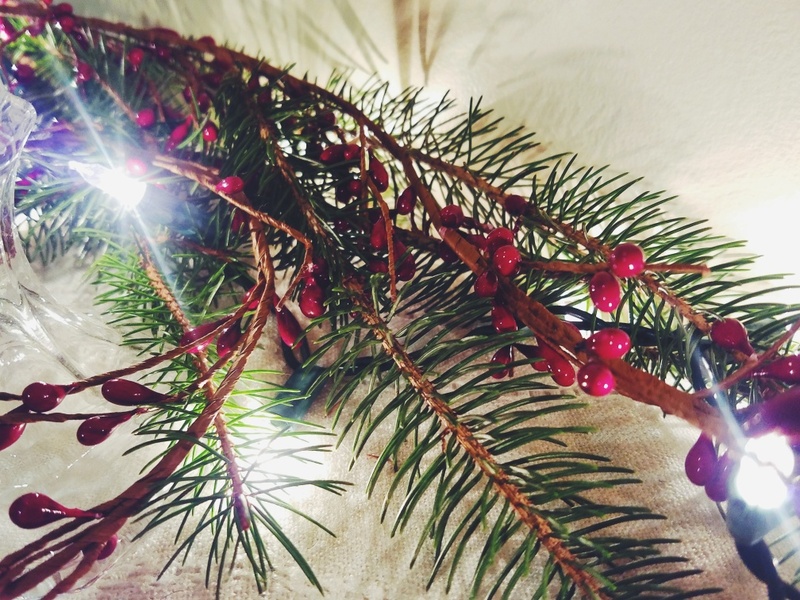 Why not donate 10 trees in the name of a loved one this holiday season? I used to do this every year, and will be sure to pick that tradition up again this year. A large number of witches and pagans are apart of the LGBTQ community, and while we don't often talk about it, suicide is just as prevalent in our community as in others. Founded in 1998, the Trevor Project provides crisis and suicide prevention for LGBTQ youths under 25. They do incredibly good work and offer a host of services to keep our LGBTQ community safe. According to Charity Watch, the Trevor Project has an A rating. If you are looking to continue to support the LGBTQ community, also consider giving to my favorite charity, Lost-n-Found Youth. This is an Atlanta, GA based charity that provides shelter, food, and support to homeless LGBTQ youth. They are the only LGBTQ friendly homeless shelter in the Atlanta area. I love their work and support them every year. They are always looking to monetary gifts, but they also have an Amazon wishlist if you would rather donate food, clothing, bedding, or backpacks. Okay, this one may seem a little odd because PetSmart is such a huge company, but they are one of the highest rated animal adoption charities in the United States. If you are looking to help get some pets adopted, PetSmart Charities is the charity to donate too. 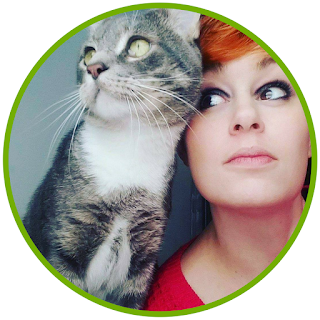 They spend less money to raise funds and 93% of donations go directly to getting animals adopted. If you have ever been to a weekend adoption at PetSmart, this is where the funds came from to help run the event. They also help support local animal shelters and provide low-cost spay and neuter. I adopted my cat Oscar Wilde from a PetSmart adoption day and its the best thing I ever did. If you are looking for other ways to give back to the homeless pets in your community, try volunteering at your local animal shelter or consider gifting your local animal shelter with used towels and blankets, pet food, and cat litter. These gifts go a long way. For those of you who don't know, my little brother has been serving in the US Army for several years as a combat medic. He did two tours in the Middle East and is currently stationed in Hawaii, the buffer between the US and North Korea. Operation Homefront is a charity that helps provide assistance to military families in the form of financial aid. Honestly, charities like this shouldn't need to exist, but because our government is too cheap to pay our service members enough to take care of themselves and their families, many families end up relying on outside help. Operation Homefront provided military families over $22.5 million in financial assistance last year, 18% of which when to help families buy groceries, 16% for rent/mortgage assistance, and 15% to keep utilities on for our military families. They also provide backpacks and academic scholarships so military children have what they need to succeed. Charity Watch gives them an A rating, with 92% of funds raised going to support our military families so they don't have to choose between food and keep the electricity on. Scholarship America helps students and communities by aiding in the development of scholarship programs around the country, specifically targetting low-income areas and families. Global scholarships are available as well. They also design and deliver high impact education programs to make a difference in these same areas to promote education as a way of rising out of poverty. There is a running list of active scholarships available on their website to ensure students can easily find and apply for scholarships across the country. I know many in our community cannot afford for their children to go to college, so consider helping support a local scholarship through Scholarship America, which has an A+ rating from Charity Watch. 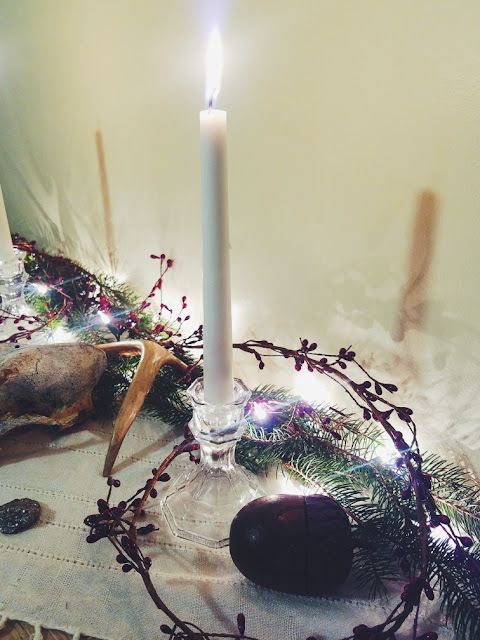 If you are looking to give to a pagan/witch specific scholarship, try one from this list or donate to Michigan Pagan Scholarships. This charity works to ensure that women around the world have reproductive and sexual rights, freedom from violence, leadership, and economic justice. The partner with other local groups to advocate for women and keep women globally safe and represented. According to Charity Watch, the Global Fund for Women as an A rating. The majority of our community includes women, and women witches in other countries are not as safe as women in the United States, Europe, and Australia. There are modern day witch burnings still occurring, most of which are directed at women. The Global Fund for Women seeks to end violence of all types against women, no matter their religious affiliation. Looking to stay local? You can use Charity Navigator to find charities in your area that meets your standards. Charity Navigator also lists the charities rating, if it has one, and a short description of the charity so you can donate your money and time wisely. You can also give to Charity Ratings, which is a nonprofit organization that unbiasedly rates and reviews charities. Their ratings are well-respected, accurate, and transparent. They also allow you to search your favorite charities to learn more about them. While not every charity is on there, the big ones are. I always search Charity Ratings before I give, unless I've worked with the charity directly before. This list is by no means all-inclusive. I tried to pick charities that do work related to paganism and witchcraft in some way or that supports a vast number of our members. If you have a charity you love to donate to, please leave a comment below. I'd like this to be a running list of great charities for witches and pagans to donate to to make the greatest impact on our community. Remember, charitable giving doesn't have to be expensive. Just $5 goes an incredibly long way. I donate $5 to charities all the time. They are happy for the donation, and while it may not seem like a lot, it does a whole lot of good, I promise. I used to work in a donation call center; we loved $5 donations! I hope you'll find it in your heart to give this holiday season and may you have a very happy holiday!